Laboratory animal models serve as a facilitator to investigate the etiopathogenesis of periodontal disease, are used to know the efficacy of reconstructive and regenerative procedures, and are also helpful in evaluation of newer therapeutic techniques including laser and implant therapies prior to application in the human beings. The aim of this review is to know the different animal models used in various specialties of dental research and to know the ethical guidelines prior to the usage of experimental models with main emphasis on how to refine, replace, and reduce the number of animal models usage in the laboratory. 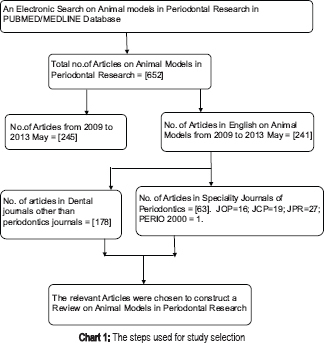 An online search for experimental animal models used in dental research was performed using MEDLINE/PubMed database. Publications from 2009 to May 2013 in the specialty of periodontics were included in writing this review. A total of 652 references were published in PubMed/MEDLINE databases based on the search terms used. Out of 245 studies, 241 were related to the periodontal research published in English from 2009 to 2013. Relevant papers were chosen according to the inclusion and exclusion criteria. After extensive electronic and hand search on animal models, it has been observed that various animal models were used in dental research. Search on animal models used for dental research purpose revealed that various animals such as rats, mice, guinea pigs, rabbit, beagle dogs, goats, and nonhuman primates were extensively used. However, with the new advancement of ex vivo animal models, it has become easy to investigate disease pathogenesis and to test the efficacy of newer therapeutic modalities with the reduced usage of animal models. 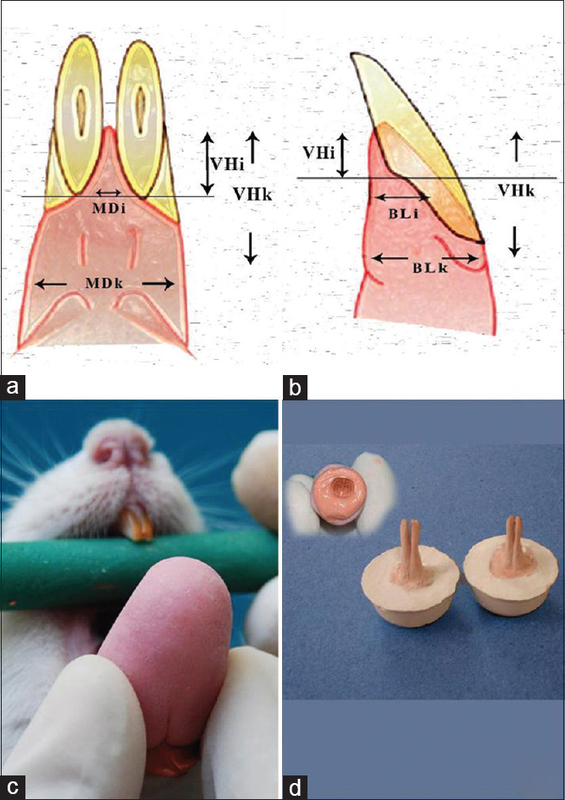 This review summarized the large amount of literature on animal models used in periodontal research with main emphasis on ethical guidelines and on reducing the animal model usage in future perspective. Background: The mainstay of periodontal therapy is mechanical removal of subgingival plaque. There is considerable interest in supplementing it with the use of antibiotics and antiseptics. Many drawbacks are associated with these adjunctive pharmacological regimens such as development of resistance to antibiotics and disruption of microflora of the gastrointestinal tract. Hence, alternate means of killing subgingival bacteria are clearly desirable. One such method is the use of laser. Aim: This study aimed to investigate antibacterial capabilities of gallium-arsenic (Ga-As) laser on photosensitized periodontopathic organisms. The three bacteria selected for the study were Porphyromonas gingivalis, Fusobacterium nucleatum, and Prevotella intermedia. Settings: The subjects for the study were selected from the patients visiting the Department of Periodontics, Karnataka Lingayat Education Society's Institute of Dental Sciences, Belgaum. Design: In vitro study design. 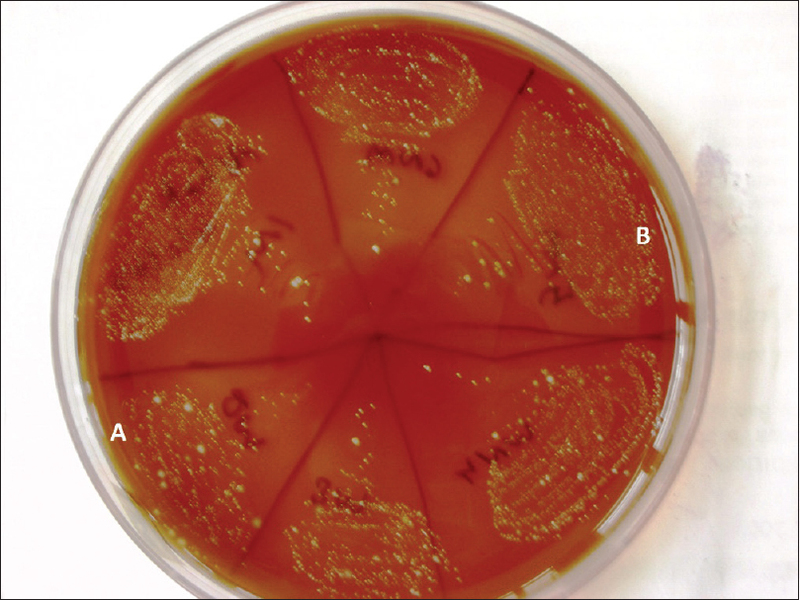 Materials and Methods: Subgingival plaque samples collected from chronic periodontitis patients were cultured anaerobically for 72 h. Predetermined number of colonies of each bacterium was taken and was then divided into cases and control groups. Both groups were photosensitized using toluidine blue O (TBO) dye and the case groups were irradiated with Ga-As laser. Bacterial colonies were then serially diluted and were incubated for subculture. After incubation period, the number of viable bacterial count was performed. Statistical Analysis: Wilcoxon-signed rank test was carried out to determine significance of reduction on subsequent dilution within the bacterial group. Mann–Whitney U-test was performed to determine the significance of reduction between cases and control of particular bacterial group. Results: The results revealed substantial reduction in the viable bacterial count. F. nucleatum was found to be most sensitive to killing by laser irradiation followed by P. intermedia and then P. gingivalis. Further, the TBO dye per se did not have any significant bactericidal effect. Conclusion: Photodynamic Therapy may prove to be a promising method for eradicating periodontopathic bacteria in near future. Background: The anti-inflammatory and immune enhancing effects of coenzyme Q10 (CoQ10) and hyaluronic acid are well established in medical literature. 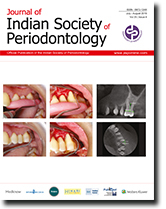 The present study was undertaken to evaluate their role in chronic periodontitis. Materials and Methods: One hundred twenty sites in 24 patients with clinically confirmed periodontitis were included in the study. A split-mouth design was used for intrasulcular application of CoQ10as adjunct to scaling and root planing (SRP), 0.8% hyaluronic acid as adjunct to SRP and SRP alone. Clinical parameters such as plaque index (PI), gingival color change index (GCCI), Eastman interdental bleeding index (EIBI), pocket depth (PD), and clinical attachment level (CAL) were recorded. All the clinical parameters PI, EIBI, GCCI, PD, and CAL were recorded at baseline before SRP. Only PI, EIBI, and GCCI were recorded at 1st and 2nd week. Twenty-one days post 2nd week, i.e., 6th week all the clinical parameters were recorded again. Results: Intragroup analysis of all the clinical parameters showed clinical significant results between baseline and 6th week. However, on intergroup analysis, the results were not significant. Conclusion: The local application of CoQ10and hyaluronic acid gel in conjunction with SRP may have a beneficial effect on periodontal health in patients with chronic periodontitis. Background: Decision-making in periodontal therapeutics is critical and is influenced by accurate diagnosis of osseous defects, especially furcation involvement. Commonly used diagnostic methods such as clinical probing and conventional radiography have their own limitations. Hence, this study was planned to evaluate the dimensions of furcation defects clinically (pre- and post-surgery), intra-surgically, and by cone beam computed tomography (CBCT) (pre- and post-surgery). 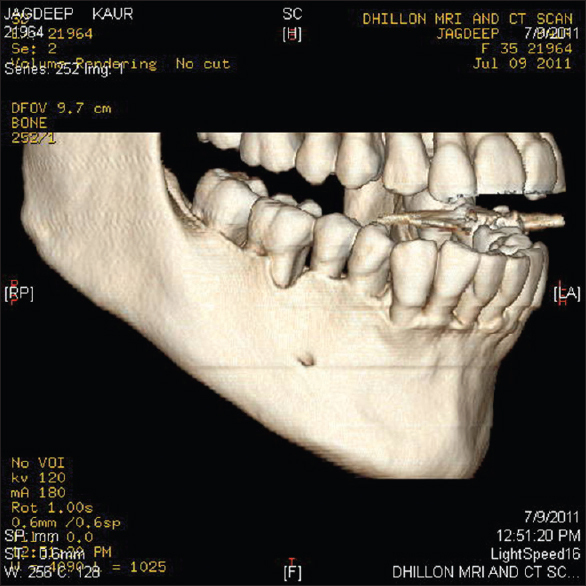 Materials and Methods: The study comprised a total of 200 Grade II furcation defects in forty patients, with a mean age of 38.05 ± 4.77 years diagnosed with chronic periodontitis which were evaluated clinically (pre- and post-surgically), by CBCT (pre- and post-surgically), and intrasurgically after flap reflection (40 defects in each). After the presurgical clinical and CBCT measurements, demineralized freeze-dried bone allograft was placed in the furcation defect and the flaps were sutured back. Six months later, these defects were evaluated by recording measurements clinically, i.e., postsurgery clinical measurements and also postsurgery CBCT measurements (40 defects each). Results: Presurgery clinical measurements (vertical 6.15 ± 1.71 mm and horizontal 3.05 ± 0.84 mm) and CBCT measurements (vertical 7.69 ± 1.67 mm and horizontal 4.62 ± 0.77 mm) underestimated intrasurgery measurements (vertical 8.025 ± 1.67 mm and horizontal 4.82 ± 0.67 mm) in both vertical and horizontal aspects, and the difference was statistically not significant (vertical P = 1.000, 95% confidence interval [CI], horizontal P = 0.867, 95% CI). Further, postsurgery clinical measurements (vertical 2.9 ± 0.74 mm and horizontal 1.52 ± 0.59 mm) underestimated CBCT measurements (vertical 3.67 ± 1.17 mm and horizontal 2.45 ± 0.48 mm). There was statistically significant difference between presurgery clinical–presurgery CBCT (P < 0.0001, 95% CI) versus postsurgery clinical–postsurgery CBCT (P < 0.0001, 95% CI) values in both vertical and horizontal aspects. Conclusion: The use of CBCT appears to be prudent for accurate diagnosis of furcation defects in advanced periodontal diseases. Presurgical and postsurgical three-dimensional imaging enable the clinician to optimize treatment decisions and assess the quantum of healing more definitively. Background: The objectives of the present study were to establish transgingival probing as an evaluating method in the clinical studies of periodontal regenerative techniques and to compare the effectiveness of transgingival probing to the surgical entry. Materials and Methods: Ten systemically healthy persons (20–50 years) with moderate to severe chronic periodontitis participated in this study. These cases were recruited into the study only when they fulfilled the eligibility criteria. Vertical probing depth (VPD) and horizontal probing depth (HPD) of furcation defects were measured with and without opening the flap, following local anesthesia during initial surgery and at 6 months after collagen membrane placement. The defect fill (DF) was also noted. The mean measurements of clinical parameters were compared by two-tailed paired t-test at 5% level of significance. Results: The difference between the measurements of VPD and HPD taken during transgingival probing and after opening the flap was lie in the range of 0.10–0.30 mm at the time of initial surgery and 6 months after surgery that was not statistically significant. Persons experienced slight discomfort or pain during opening the flap as compared to transgingival probing, and this method was also appreciated by the patients as it is easy, simple and does not involve the surgical procedure. Conclusion: The results of the study suggest that measurements recorded during transgingival probing and after opening the flap do not influence the required outcome of regenerative therapies, i.e., DF that was not statistically significant difference from surgical reentry. Therefore, it was concluded that transgingival probing could be used as evaluating parameters to see the outcome of regenerative surgeries and the surgical reentry procedure may be avoided because it is a second surgical procedure, time-consuming and interrupts the healing process. Background: Drug-induced gingival overgrowth (DIGO) is a well-known adverse effect of cyclosporine A (CsA) and nifedipine (Nf) therapy. The aim of the present morphometric study was to evaluate the effect of azithromycin (Azi) on the combined GO in rats induced by CsA + Nf combination. Materials and Methods: Thirty Sprague-Dawley male rats were randomly divided equally into three groups. Group 1 (control) received olive oil only; Group 2 received a combination of CsA and Nf in olive oil throughout the study period; Group 3 received CsA + Nf combination therapy, and Azi was added for 1 week in the 5th week. All the drugs were delivered by oral route. Impressions of the mandibular central incisal regions were taken, and study models were prepared at baseline and biweekly up to the 8 weeks. Statistical analysis was done by one-way analysis of variance and intergroup comparisons were made using Tukey's post hoc analysis. Results: Significant GO was evident in Group 2 and Group 3 rats when compared to Group 1. However, in Group 3 (Azi), GO was observed up to the 4th week, but a significant decrease in GO was noticed during 6–8th week after the administration of Azi in 5th week. Conclusion: Azi is an effective drug in the remission of DIGO induced by combined therapy of CsA + Nf and thereby can be considered as a useful therapeutic regimen in minimizing the DIGO in transplant patients. Background: Intubated patients in Intensive Care Unit (ICU) are not able to take care of their mouth health, so they are at risk of bacterial colonization and dental plaques formation that can lead to systemic diseases such as pneumonia and gingivitis. Aims: In randomized, double-blind clinical study, the efficacy of natural herbal mouthwash containing Salvadora persica ethanol extract and Aloe vera gel was compared with chlorhexidine on gingival index (GI) of intubated patients in ICU. 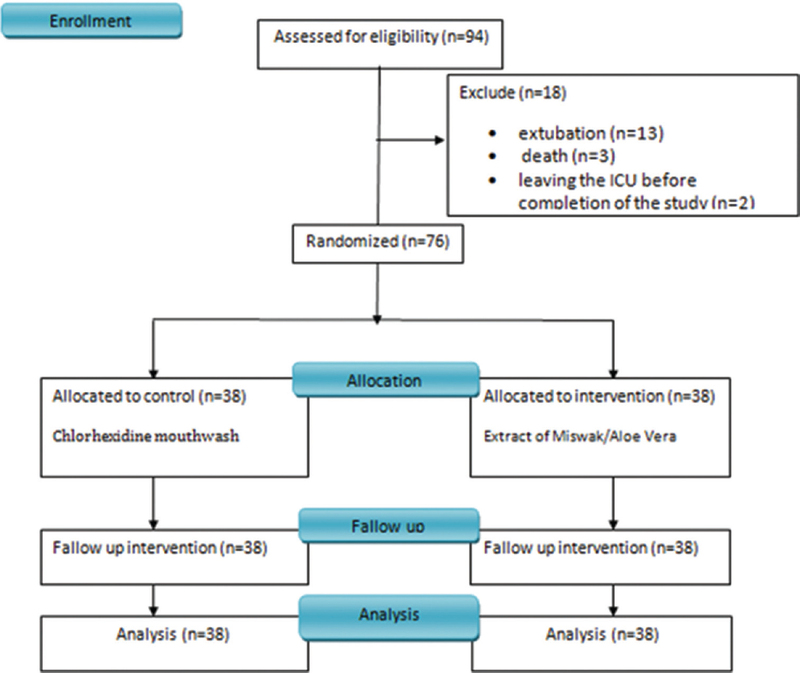 Materials and Methods: Seventy-six intubated patients (18–64 years old with mean age 40.35 ± 13.2) in ICU were admitted to this study. The patients were randomly divided into two groups: (1) Herbal mouthwash and (2) chlorhexidine solution. Before the intervention, the GIs was measured by modified GI device into two groups. The mouth was rinsed by mouthwashes every 2–3 h for 4 days. 2 h after the last intervention, GIs were determined. Results: Along with mechanical methods, herbal mouthwash in reducing GI was statistically significant than that of chlorhexidine (P < 0.05). Conclusion: The results of this study introduce a new botanical extract mouthwash with dominant healing effects on GI (1.5 ± 0.6) higher than that of synthetic mouthwash, chlorhexidine (2.31 ± 0.73). Background: Simvastatin (SMV), a new locally delivered drug of class statins, is a specific competitive inhibitor of 3-hydroxy-2-methyl-glutaryl coenzyme A reductase. Statins, besides having lipid-lowering abilities, also have pleiotropic effects like host modulation and bone regeneration. 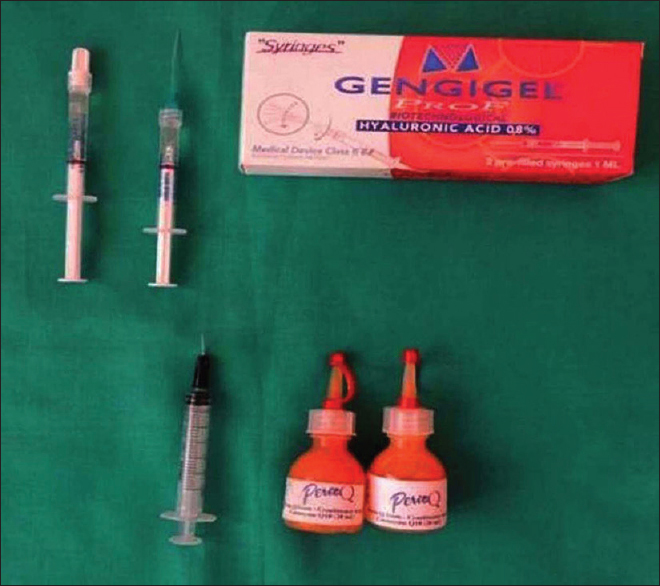 The present study was designed to investigate the effectiveness of SMV, 1.2 mg, in an indigenously prepared biodegradable controlled-release gel as an adjunct to scaling and root planing (SRP). Materials and Methods: A total of 60 sites, with pocket depth ≥5 mm, two from each of 30 patients after SRP, were categorized into two treatment groups, for subgingival placement of placebo (Gp 1) or SMV (Gp 2). Clinical parameters were recorded at baseline and at 1, 3 and 6 months comprising plaque index, gingival index, probing pocket depth (PPD) and clinical attachment level (CAL). The osseous changes were evaluated radiographically by measuring vertical gain, INFRA 1 and angle of the defect, INFRA 2 from baseline to 6 months. Results: All subjects tolerated the drug, without any post-application complication. The treatment improved the periodontal condition in both the groups but significant reductions in PPD (p= 0.04), and INFRA 1 (p= 0.000), along with gain in CAL (p= 0.02) and INFRA 2 (p= 0.000) were observed in Gp 2. In one site, an unexpected 5 mm decrease in INFRA 1 was found. Conclusion: Local drug delivery of SMV enhanced the beneficial effect of SRP, in pocket reduction, gain in CAL and bone fill. Background: Many factors contribute to uneventful and healthy postoperative healing. Hence, closure of periodontal flap postsurgery for the attainment of primary union between flap margins is of utmost importance. Isoamyl 2-cyanoacrylate is a tissue adhesive, which can be used for the closure of elevated flaps to overcome the problems associated with conventional suture material like silk. Aim: This study aims to compare healing after periodontal flap surgery using isoamyl 2-cyanoacrylate (bioadhesive material) and silk sutures. Materials and Methods: The study was carried out on twenty patients who needed flap surgical procedure for pocket therapy. Statistical Analysis Used: Results were subjected to statistical analysis. Paired t-test was used for intragroup postprocedure improvement in each parameter, and independent sample t-test was used for intergroup comparison. Results: Early healing was seen with isoamyl 2-cyanoacrylate during the 1st week when compared with silk. However, no significant difference was seen in the 2nd week when both the materials were compared. Conclusions: It can be concluded that cyanoacrylate aids in early initial healing. Background: To evaluate the relative efficacy of synthetic nanocrystalline hydroxyapatite (HA) (Ostim®) and microcrystalline HA (Osteogen®) bone grafts in the treatment of human periodontal intrabony defects clinically and radiographically through denta scan. Materials and Methods: Ten chronic periodontitis patients with bilateral intrabony periodontal defects of ≥2 mm radiographic defect depth below 55 years of age were selected randomly and treated with synthetic nanocrystalline HA (Ostim®) or synthetic microcrystalline HA (Osteogen®) bone graft. Clinical parameters including probing depth (PD) and clinical attachment level (CAL) were measured preoperatively and postoperatively at 3 and 6 months for each of the defects using an occlusal acrylic stent. Radiographic parameters were measured with the help of denta scan preoperatively and postoperatively at 6 months. Results: At 6 months following therapy, the Osteogen® group showed a reduction in mean PD from 11.10 ± 1.663 to 8.50 ± 0.850 mm and a change in mean CAL from 6.30 ± 1.160 to 3.40 ± 0.516 mm, whereas in the Ostim® group, the mean PD decreased from 11.20 ± 0.919 to 8.30 ± 0.823 mm and mean CAL decreased from 6.10 ± 0.738 to 3.30 ± 0.483 mm. At 6 months following therapy, denta scan showed a reduction in mean intrabony defect depth in the Osteogen® group from 2.54 ± 0.786 to 1.01 ± 0.448 mm, whereas in the Ostim® group, it was 2.71 ± 0.650 mm to 1.12 ± 0.563 mm. Conclusion: It was concluded that both the HA bone grafts produced statistically significant reduction in pocket depth, in the depth of osseous lesion, and a statistically significant gain in attachment level, irrespective of their physico-chemical properties. Background: A randomized, prospective clinical, radiographical, and histological study was conducted to evaluate healing after alveolar ridge preservation technique using two different graft materials, namely, a novel autogenous graft material i. e., autogenous tooth graft (ATG) and beta-tricalcium phosphate (β-TCP) alloplast. 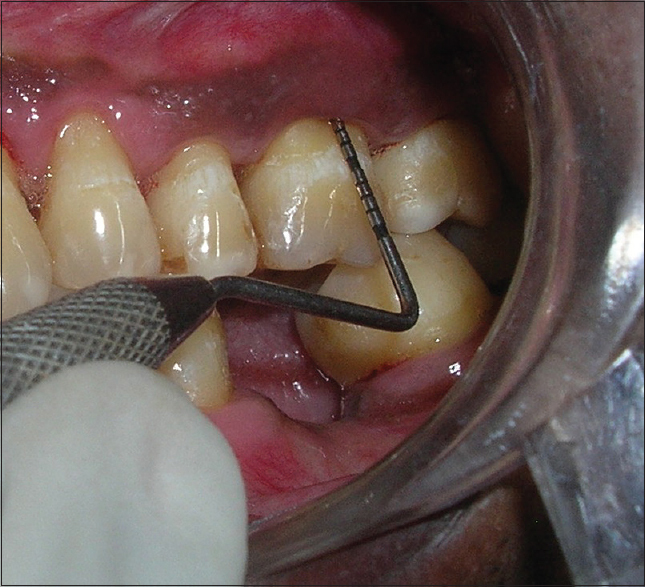 Materials and Methods: Fifteen patients undergoing extraction of at least three teeth were selected. Atraumatic extractions were performed. Of the three extraction sockets, one was grafted with ATG, other with β-TCP, and the third was left ungrafted. Cone-beam computed tomography scans were taken immediately after grafting and 4 months postoperatively to check the changes in alveolar crest height and width at all the sites. Three patients in whom implant placement was done after complete healing; bone samples were harvested using a 3 mm diameter trephine during osteotomy preparation from both the ridge preserved sites and studied histologically. Results: There was a statistically significant difference when the changes in width and height of alveolar crest were compared within all the three groups (P < 0.05). Among three sites, ATG-grafted sites showed the most superior results with a minimal reduction in alveolar crest height and width. Histological analysis also showed the same trend with more new bone formation at ATG-grafted sites as compared to β-TCP-grafted sites. Conclusion: Postextraction, ridge preservation leads to more predictable maintenance of alveolar ridge height and width. ATG as compared to β-TCP provided superior results. Based on this, we conclude that ATG material can serve as a better alternative to conventional bone graft materials. Background: Gingival recession is a common condition and is more prevalent in smokers. It is widely believed that root coverage procedures in smokers result in less desirable outcome compared to nonsmokers', and there are few controlled studies in literature to support this finding. Therefore, the purpose of this study was to evaluate and compare the outcome of root coverage with sub-epithelial connective tissue graft (SCTG) in nonsmokers and smokers. Materials and Methods: A sample of twenty subjects, 10 nonsmokers and 10 smokers were selected each with at least 1 Miller's Class I or II recession on a single rooted tooth. 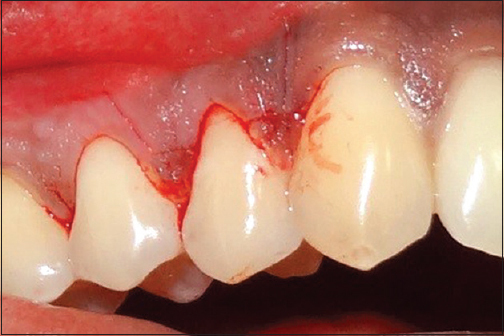 Clinical measurements of probing depth, clinical attachment level (CAL), gingival recession total surface area (GRTSA), depth of recession (RD), width of recession (RW), and width of keratinized tissue were determined at baseline, 3, and 6 months after surgery. 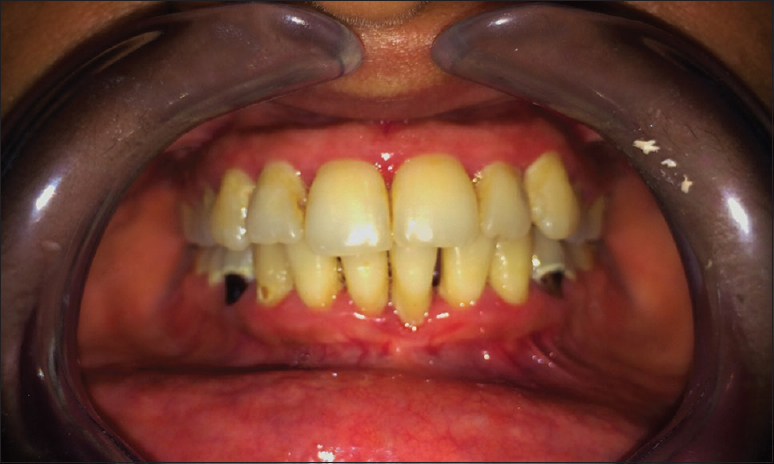 Results: The treatment of gingival recession with SCTG and coronally advanced flap showed a decrease in the GRTSA, RD, RW, and an increase in CAL and width of keratinized gingiva in both the groups. However, the intergroup comparison of the clinical parameters showed no statistical significance. About 6 out of 10 nonsmokers (60%) and 3 smokers (30%) showed complete root coverage. The mean percentage of root coverage of 71.2% in nonsmokers and 38% in smokers was observed. Conclusion: The results of the present study suggest that smoking may negatively influence gingival recession reduction and CAL gain. In addition, smokers may exhibit fewer chances of complete root coverage. Overall, nonsmokers showed better improvements in all the parameters compared to smokers at the end of 6 months. Background: The aim of this study was to determine the treatment outcome of the use of a porcine monolayer collagen matrix (mCM) to increase soft-tissue volume as a part of implant site development. Materials and Methods: Implants were placed in single sites in 27 patients. In the test group, mCM was used for soft-tissue augmentation. No graft was placed in the control group. Soft-tissue thickness (STTh) was measured at the time of surgery (T0) and 6 months postoperatively (T1) at two sites (STTh 1, 1 mm below the gingival margin; STTh 2, 3 mm below the mucogingival margin). Results: Significant increases (P < 0.001) in STTh (STTh 1 = 1.06 mm, 117%; STTh 2 = 0.89 mm, 81%) were observed in the test group. Biopsy results showed angiogenesis and mature connective tissue covered by keratinized epithelium. Conclusions: Within the limitations of this study, it could be concluded that mCM leads to a significant increase of peri-implant soft-tissue thickness, with good histological integration and replacement by soft tissue and may serve as an alternative to connective tissue grafting. Background: Periodontal deterioration has been reported to be associated with systemic diseases such as cardiovascular disease (CVD), diabetes mellitus, respiratory disease, liver cirrhosis, bacterial pneumonia, nutritional deficiencies, and adverse pregnancy outcomes. Aim: The present study assessed the periodontal disease among patients with systemic conditions such as diabetes, CVD, and respiratory disease. Materials and Methods: The study population consisted of 220 patients each of CVD, respiratory disease, and diabetes mellitus, making a total of 660 patients in the systemic disease group. A control group of 340 subjects were also included in the study for comparison purpose. The periodontal status of the patients with these confirmed medical conditions was assessed using the community periodontal index of treatment needs (CPITNs) index. Results: The prevalence of CPITN code 4 was found to be greater among the patients with respiratory disease whereas the mean number of sextants with score 4 was found to be greater among the patients with diabetes mellitus and CVD. The treatment need 0 was found to be more among the controls (1.18%) whereas the treatment need 1, 2, and 3 were more among the patients with respiratory disease (100%, 97.73%, and 54.8%), diabetes mellitus (100%, 100% and 46.4%), and CVD (100%, 97.73%, and 38.1%), in comparison to the controls (6.18%). Conclusion: From the findings of the present study, it can be concluded that diabetes mellitus, CVD, and respiratory disease are associated with a higher severity of periodontal disease. Introduction: The sense of coherence (SOC) has been suggested to be highly applicable concept in the public health area because a strong SOC is stated to decrease the likelihood of perceiving the social environment as stressful. This reduces the susceptibility to the health-damaging effect of chronic stress by lowering the likelihood of repeated negative emotions to stress perception. Materials and Methods: The demographic data and general information of subjects' oral health behaviors such as frequency of cleaning teeth, aids used to clean teeth, and dental attendance were recorded in the self-administered questionnaire. The SOC-related data were obtained using the short version of Antonovsky's SOC scale. The periodontal status was recorded based on the modified World Health Organization 1997 pro forma. Results: The total of 780 respondents comprising 269 (34.5%) males and 511 (65.5%) females participated in the study. A significant difference was noted among the subjects for socioeconomic status based on gender (P = 0.000). The healthy periodontal status (community periodontal index [CPI] code 0) was observed for 67 (24.9%) males and 118 (23.1%) females. The overall SOC showed statistically negative correlation with socioeconomic status scale (r = −0.287). The CPI and loss of attachment (periodontal status) were significantly and negatively correlated with SOC. Conclusion: The present study concluded that a high level of SOC was associated with good oral health behaviors, periodontal status, and socioeconomic status. The Whale's tail technique performed to obtain maximum interdental papilla fill in the anterior region after placement of bone grafts. This study aims to assess the clinical efficacy of this new technique. This report describes a series of three cases with a probing depth of 6–7 mm in the maxillary anterior teeth and their treatment with Whale's tail technique to obtain regeneration and maximum papilla preservation. 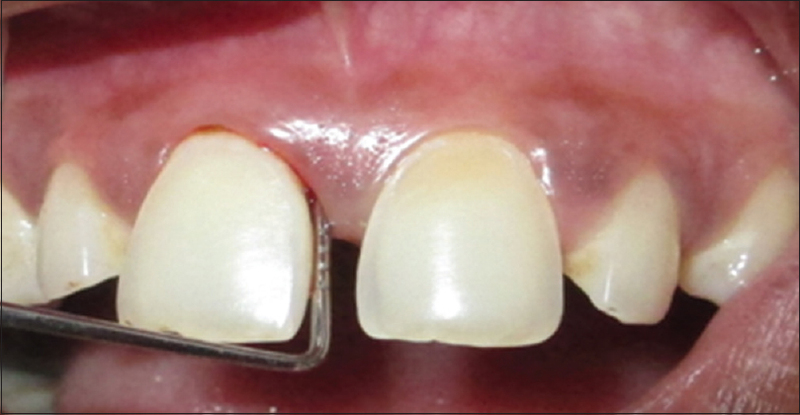 The cases in this report showed a pocket depth reduction of 3-4mm and a clinical attachment gain of 3-4mm.The application of the “Whale's tail” flap leads to clinically significant improvement of hard and soft tissue conditions and allows regeneration of wide intrabony defects involving the maxillary anterior teeth with notable interdental diastemas, maintaining interproximal tissue to recreate a functional attachment with esthetic results. Previous studies have reported the management of Class I and II papillary defects, but knowledge on Class III defects, estimated to have a poor periodontal prognosis, remains minimal. 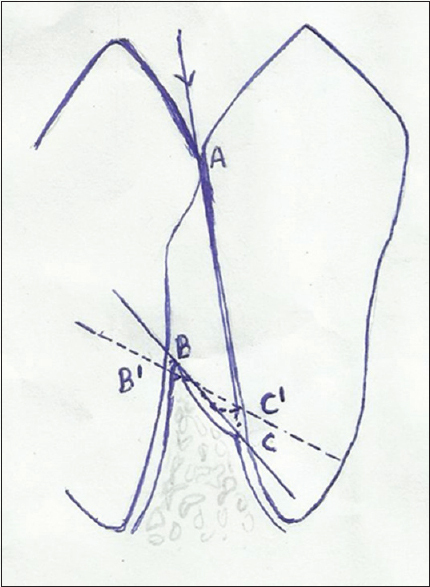 In this case report, a Class III papillary defect reconstruction was attempted mainly since the patient reported with difficulty in phonetics. In Stage I, autogenous bone graft from the maxillary tuberosity and subepithelial connective tissue graft was augmented to decrease the distance between the interdental bone crest and contact point, simultaneously achieving a switch in the periodontal biotype. In Stage II, subepithelial connective tissue graft was augmented to achieve papillary fill. To avoid manual errors associated with quantifying the posttreatment outcomes, image data processing ImageJ software was used to assess the length, perimeter, and surface area of papillary loss using the preoperative images. The posterior maxillary segment frequently exhibits insufficient bone mass to support dental implants. Sinus floor augmentation enables implant placement in the posterior maxilla. 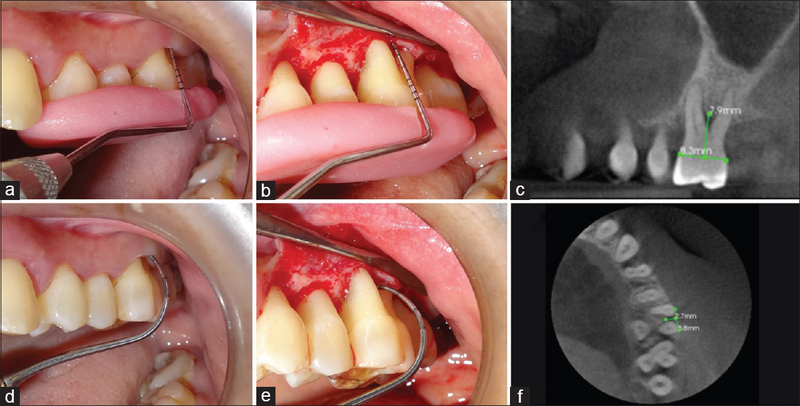 This case series included ten sites, in which sinus floor elevation was done using sinus lift balloon system followed by augmentation utilizing irradiated cancellous bone allograft. Postoperative radiographic assessment of vertical bone gain was done at 3 and 6 months follow-up period. The mean initial and final bone height were 6.16 and 10.50 mm, respectively, with a mean increase of 4.34 mm at 6 months being observed with nil complication. The presented technique might represent a viable alternative for sinus elevation in posterior atrophied maxilla. Irradiated cancellous bone allograft can be advocated as an ideal bone graft material for sinus augmentation procedures. Aim: The study aimed to assess the levels of awareness about the mutual relationship between diabetes and periodontitis among high-risk age group of the general population and to assess the attitude of general physicians in suggesting diabetic patients to visit a dentist. Materials and Methods: A structured, closed-ended questionnaire either in English or in local language (Telugu) was distributed and collected from 203 patients who were willing to participate in the study attending the Department of Periodontics, Narayana Dental College & Hospital, Nellore, AP. Data were statistically analyzed and represented in percentages and number. 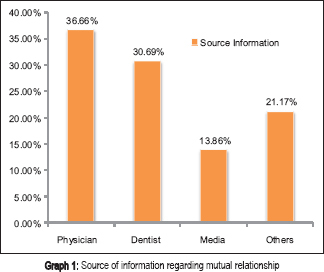 Results: Only 49.8% of the sample population knew about the mutual relationship between diabetes and periodontitis and only 46% of the diabetic study population was suggested to visit a dentist by the physician. Conclusion: There is an insufficient knowledge among the diabetic population regarding the mutual relationship. Only few physicians have suggested their diabetic patients to visit a dentist. As diabetic patients tend to visit a physician earlier than a dentist, it is their responsibility to educate and motivate their patients to seek dental treatment.